I can’t tell you how much I love the first one. I would seriously wear it every day if I could. It warms all the right places without making me too hot, it’s comfy, and super cute. I’m sure there will be another one of these (or two or three) in my future. But probably not this summer. I was in the mood for a quick knit, and five days after casting on here it is. The only adjustment from the first one is I used size 8 needles instead of 9’s. Dream in Color Shrug #2. 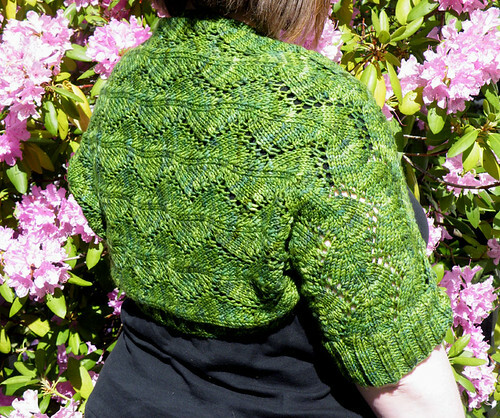 Knit with 1.5 skeins of Dream in Color Classy in the Happy Forest color. So beautiful! I did some socks in that color and adore it. Gorgeous! And the photos are so lovely, too. Very pretty honey! Your flowers are beautiful! Beautiful, as always. That’s an absolutely perfect color for spring and summer. Nice and vibrant but not gaudy or garish. I have those same flowers growing on either side of my front door. Btw, thanks for coming to WWKIP day. 😉 It was great meeting you in person. (2) I just bought this pattern from Wool Girl tonight (a friend on another thread recommended it to me). What a crazy small world it is!!! 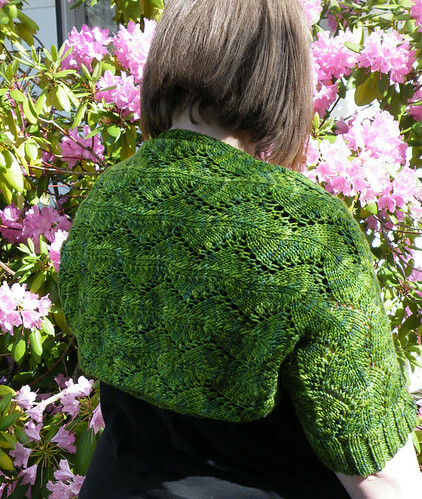 Love your shrug–hope mine turns out half as nice! !